Birthplace : Washington D.C., U.S.
John F. Kennedy Jr., son of the late president John F. Kennedy (1917–1963), avoided politics and followed his own path as a magazine publisher. After attending his own father's funeral as a child, Kennedy, Jr., saw a series of early deaths in his family. He himself was claimed by a tragic accident in the prime of his life. John Fitzgerald Kennedy Jr., was born on November 25, 1960, the son of John F. Kennedy (1917–1963), who had just won election as the thirty-fifth president of the United States, and Jacqueline ("Jackie") Kennedy (1929–1994). He was the first child ever born to a president-elect. The Kennedys gave the nation the closest model they had ever had to a royal family. John-John, as he became known, and his sister Caroline regularly made the news and helped to create an image of the Kennedys as an ideal American family. While campaigning in Dallas, Texas, on November 22, 1963, the president was shot and killed. Just three months earlier, the family had grieved when new baby Patrick died two days after his birth. The death of John F. Kennedy shocked the nation, and the image of the president's three-year-old son at the funeral, wearing a short coat that revealed his bare knees, saluting his father's coffin as it passed, was heartbreaking. In 1964 Jackie Kennedy moved with her children to an apartment in New York City, where she hoped they might be able to avoid the media. The family would soon suffer another difficult loss. On June 6, 1968, the late president's brother, Robert Kennedy (1925–1968), who had become a father figure to his nephew and niece, was assassinated in California while campaigning for the Democratic presidential nomination. Four months later, Jackie Kennedy married the wealthy businessman Aristotle Onassis (1906–1975). The young Kennedy would sometimes get into fights with reporters and photographers who followed him and his sister around. The media criticized him for being self-centered and for his less than outstanding record at school. After high school he became more serious about his education. First, he studied environmental issues at a school in Africa. He would later return to Africa following his freshman year at Brown University in Providence, Rhode Island. While in Africa he worked with a mining firm in Johannesburg, South Africa, and met student and government leaders in Zimbabwe. During his college years he also worked with the Peace Corps in Guatemala to help earthquake victims. After graduating with a bachelor's degree in American history in 1982, Kennedy studied at the University of Delhi in India. When he returned to the United States he went to work for the New York City Office of Business Development in 1984. In 1986 he entered New York University Law School, mainly to please his mother. At the 1988 Democratic National Convention he gave a speech to introduce his uncle, Senator Edward Kennedy (1932–), that earned him a two-minute standing ovation and led many to wonder if he was preparing to run for office. He passed his bar exam (a test that a person must pass before he or she is allowed to practice law) on the third try and was hired in August 1989 as an assistant prosecutor in the Manhattan office of New York district attorney Robert Morgenthau (1919–). He won all six of the cases that he prosecuted in court before leaving the position in 1993. In September 1995 Kennedy cofounded George magazine, which had the slogan "Not politics as usual." He wrote essays and interviewed people for the publication. Some observers suggested that his magazine venture was a way for him to gain the public-affairs knowledge that he would need in order to run for office, but he denied that he was planning to enter politics. On September 21, 1996, he married Carolyn Bessette (1966–1999) in a private ceremony on Cumberland Island off the coast of Georgia. It was one of the few major events in his life during which he managed to avoid publicity. He and his wife appeared to be a happy couple as they made their home in New York. On July 16, 1999, Kennedy, his wife, and her sister Lauren Bessette (1964–1999) were declared missing at sea after their plane crashed into the water near the coast of Martha's Vineyard, Massachusetts. Kennedy was an amateur pilot who had earned his license in April 1998. All three bodies were eventually recovered from the wreckage and buried at sea on July 22, 1999. 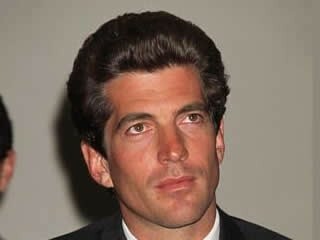 View the full website biography of John F. Kennedy Jr..